It had been fourteen long years since we last visited Rome. And when we finally got back, our first thought was that we couldn’t believe we had waited so long to return. With thousand year old imperial ruins flanking majestic Renaissance-era palaces standing alongside grand Baroque squares it is obvious that Rome wasn’t built in a day. No, Rome was painstakingly constructed over the millennia, layer upon layer, out of sheer awesomeness. Even for slightly jaded full-time travelers who’ve probably grown a bit too accustomed to awe inspiring sights, Rome awed us. When we finally recovered well enough from our first impressions to close gaping mouths, a second – less awesome – thought occurred to us: where did all these people come from? 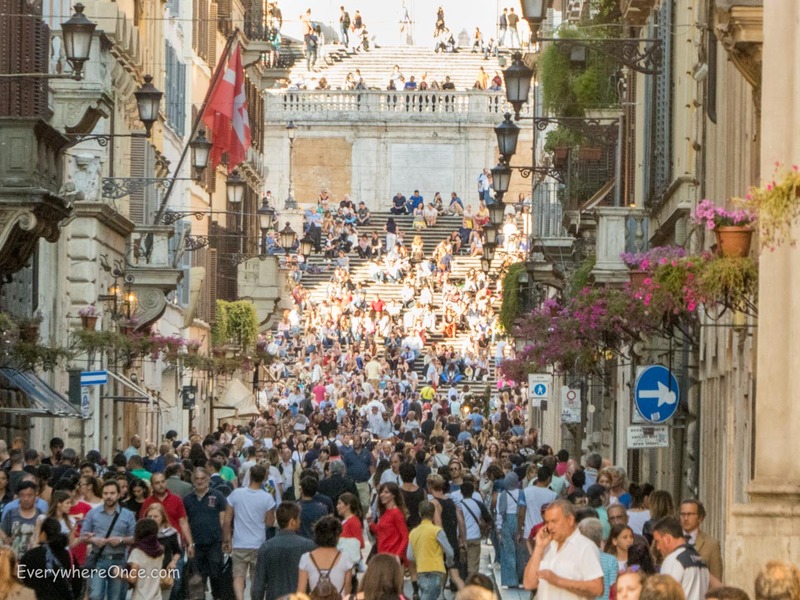 We certainly didn’t remember Rome being this crowded. The Spanish Steps at 6:30 in the evening. It’s possible that through the rose colored glass of recollection we airbrushed the hordes of people we encountered on this trip out of the memories of our last. More likely, the crowds really are that much worse now. Either way, it’s hard to think of another large city so completely dominated by tourism as is Rome. The full impact of this development didn’t hit us until we tried to visit Saint Peter’s Basilica in the early afternoon. We never did see the end of the line to get into the church. It started at the front of the façade, snaked rightward along the entire length of the colonnade, completely encircled Saint Peter’s Square, and disappeared off into the distance somewhere on the left. It may have been the longest line I’ve ever seen. Needless to say, we didn’t get inside Saint Peter’s on our first attempt. 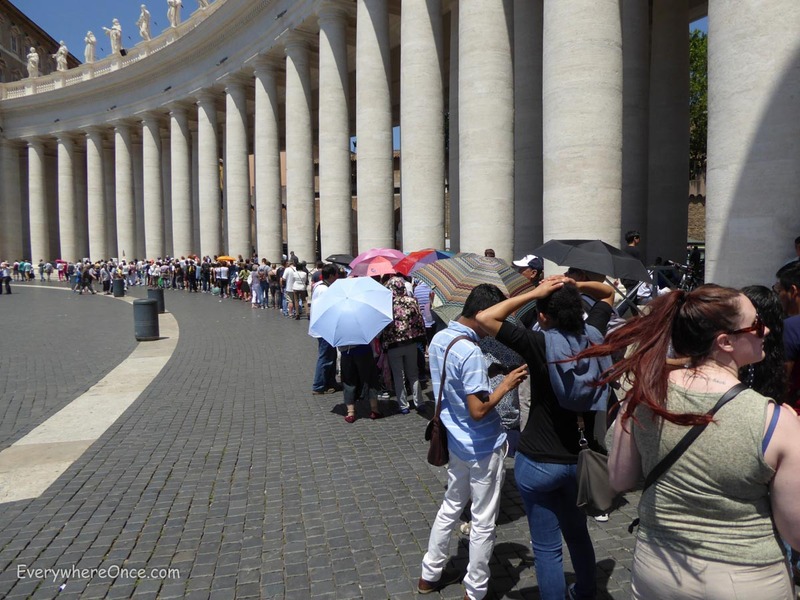 We think this is about one-quarter of the security line in front of Saint Peter’s Basilica. Because we never found the end of the line, this could be significantly less than that. Instead we planned to do what we always do when confronted with such crowds. We got up early the next morning and went back to Saint Peter’s just before opening. At that time there were maybe fifty people waiting in front of us. Once the doors opened, promptly at 8:00 A.M., it took about ten minutes for us all to clear security screening. Inside, the massive church swallowed up the small crowd. At that hour it was easy to feel like we had the grandest church in all of Christendom mostly to ourselves. By the time we left, maybe an hour or so later, the security line had already backed up half-way around Saint Peter’s Square. It was clear from this experience that most of Rome’s biggest attractions were going to be a complete mess. Based on our prior experience in Rome we had already decided to skip the Sistine Chapel. Even fourteen years ago we struggled to endure the mile-long, shoulder-to-shoulder, forced march through the Vatican Museums. It was a lowlight of last our trip. Things must only be worse today, if that’s at all possible. After seeing the long lines of people sizzling in the summer Mediterranean sun outside Saint Peter’s, we made a strategic decision to cross most of Rome’s other high profile attractions off of our to-do list as well. Gone were the interior of the Coliseum, the Roman Forums, and Piazza Venezia’s monuments from our itinerary. We tried to make an exception to visit the Borghese Galleries but, not surprisingly, tickets were sold out more than a week in advance. We wandered past some other “MUST SEE!! 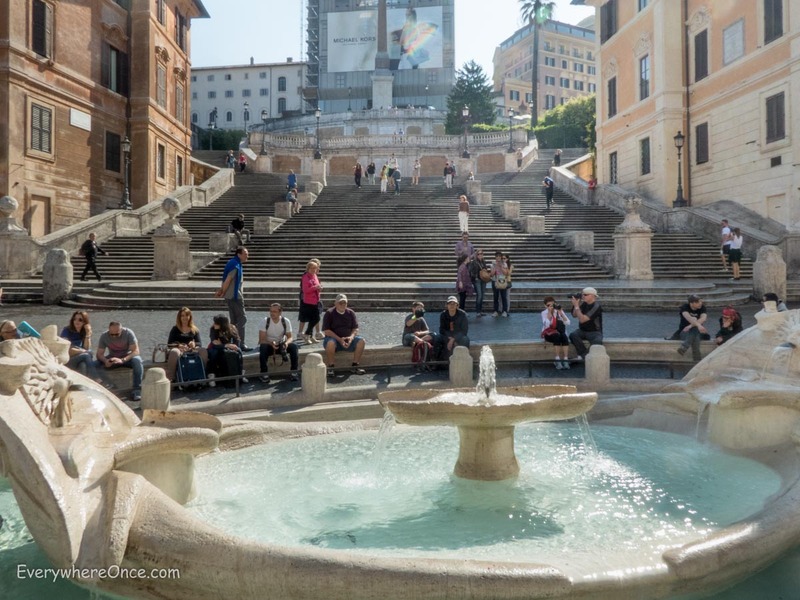 !” attractions, like the Spanish Steps and the Trevi Fountain and wondered why, with all of the amazing things in Rome, we must see these things specifically? If you want to rub shoulders with tour groups, these are certainly good places to go. But even when empty they’re not noticeably better than the dozens of other lesser-visited sites in the city. Or at least that was our impression after we filled our itinerary with Rome’s secondary and tertiary sites. Saint Peter’s is perhaps the exception that proves the rule. The Basilica really is a “must see.” It’s one of a handful of places in the world that literally left me speechless the first time I visited. It is so large, so ornate, and so utterly unbelievable that it completely overwhelms your senses. But as great as Saint Peter’s unquestionably is, on my second visit I noticed that it is really just a larger version of the hundred or more other churches you’ll find every couple of blocks throughout Rome. Most of which are virtually empty. Santa Maria in Traspontina is a great example. 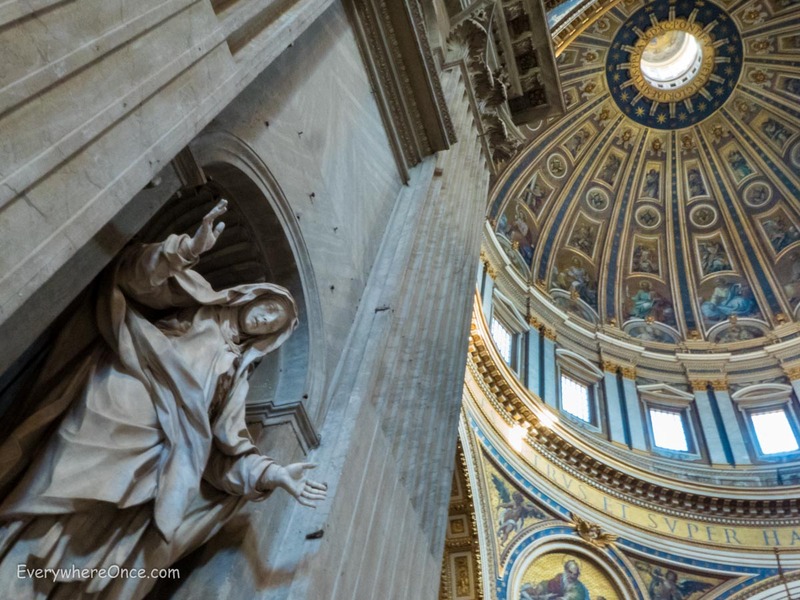 Located on the primary approach to Saint Peter’s Square, a mere three blocks shy of the main gates, it is difficult to visit the Basilica without also walking right past Santa Maria. And that is what most travelers do. When we left the Basilica at nine in the morning the line to get in to Saint Peter’s was probably already an hour and a half long. At Santa Maria, meanwhile, we encountered no line outside and near emptiness inside. This lack of tourist love, so close to where thousands of tourists were standing idle, is remarkable. 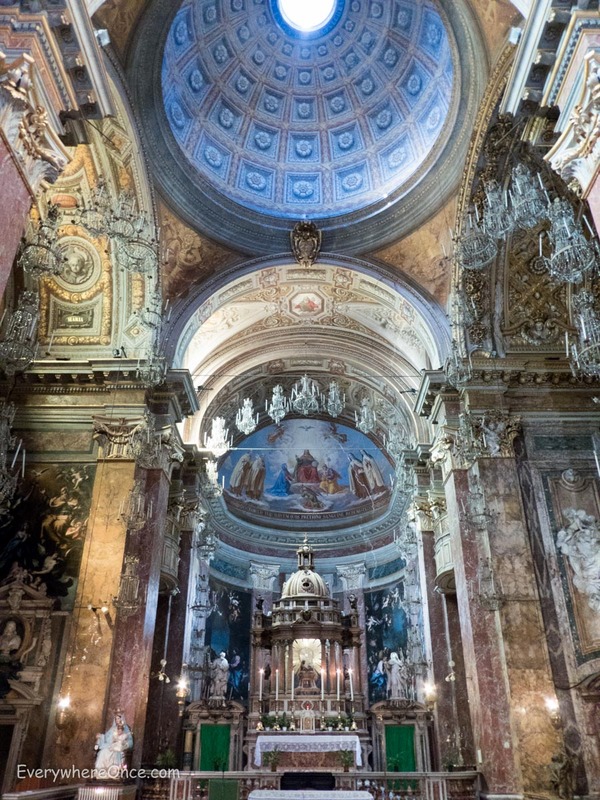 In any other city but Rome, Santa Maria in Traspontina would almost certainly rank as a main attraction. 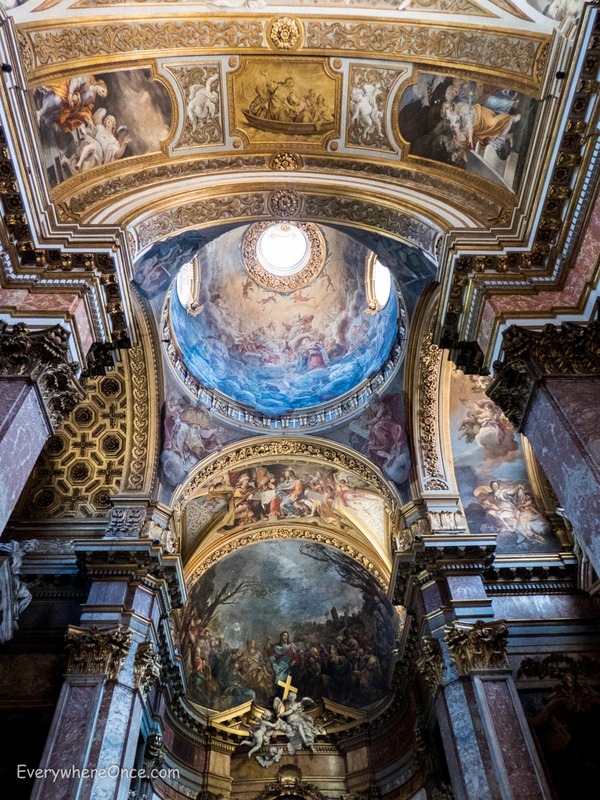 Its four frescoed chapels, elaborately carved alter, and important Christian artifacts are so singularly impressive they could easily be mistaken for a section within Saint Peter’s. But in Rome, it’s just another church. After seeing Santa Maria we decided to use the time we freed by not standing in line at the Coliseum to pop into other random churches. We were routinely wowed. Not only were they gorgeous, they were generally free of crowds. The same can’t be said for a different Roman church. Long before we even saw its iconic facade we knew we were getting close to the Pantheon. The thickening crowds and sudden appearance of men hawking selfie-sticks told us we were drawing close to a major attraction. 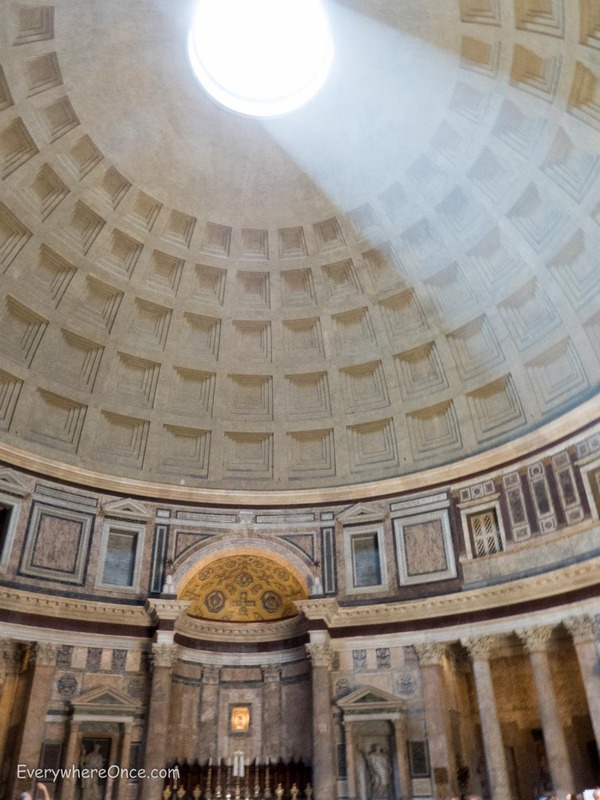 By the time we arrived at the Piazza della Rotunda we were fighting our way through a shoulder to shoulder mob that amassed beneath the Pantheon’s oculus and radiated outward in all directions. This celebrity status is hard to explain. While we understand the archaeological importance of the Pantheon, there are many Roman churches that offer more impressive sightseeing. The Pantheon (left) and Santa Maria Maddalena in Campo Marzio (right). One of these is hugely popular. The other is pretty much empty. And even some that are nearly as old. 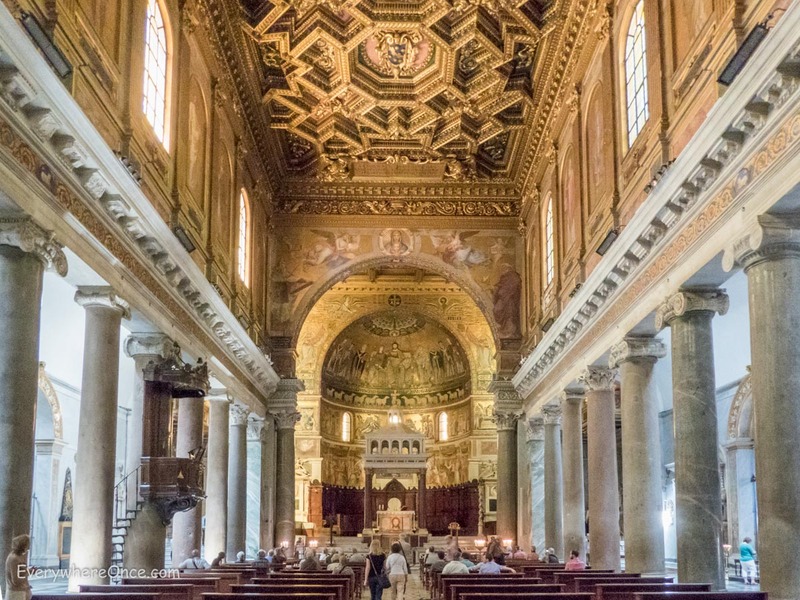 The Basilica of Santa Maria in Trastevere, for example, boasts architecture that dates back to the fourth century. It also happens to be one of the city’s most unique. 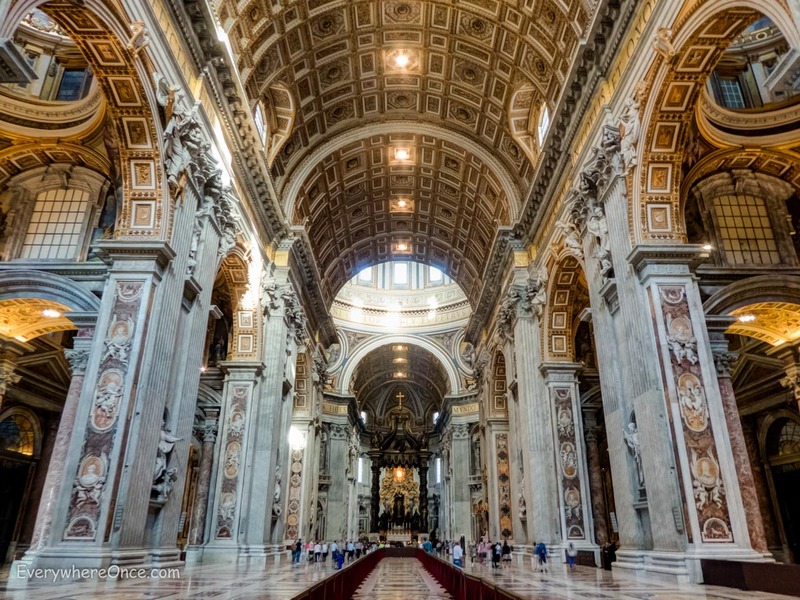 Instead of sporting typical towering arches, its nave is lined with twenty two granite columns that hoist the type of gilded wood ceiling you more commonly find in Venetian palaces but rarely see in churches. 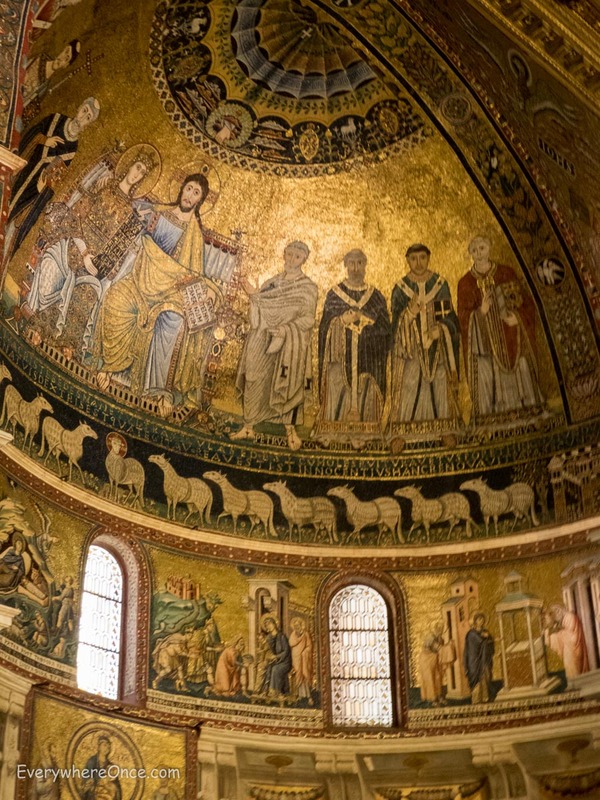 The real treat at Santa Maria, though, is the collection of twelfth century mosaics that decorate both its interior and exterior. The gilded tiles lining the apse vault commemorating the coronation of Mary is most striking. Even though this minor basilica is listed as the 29th “thing to do” by TripAdvisor, we didn’t encounter many other visitors there. Most folks just don’t spend long enough in the city to check thirty things off their list. And while that’s too bad for them, it bodes well for anyone wanting to visit the hundreds of great Roman sites that don’t make anyone’s Top Ten list. At these places you can still find the rarest of all Roman treasures: solitude. 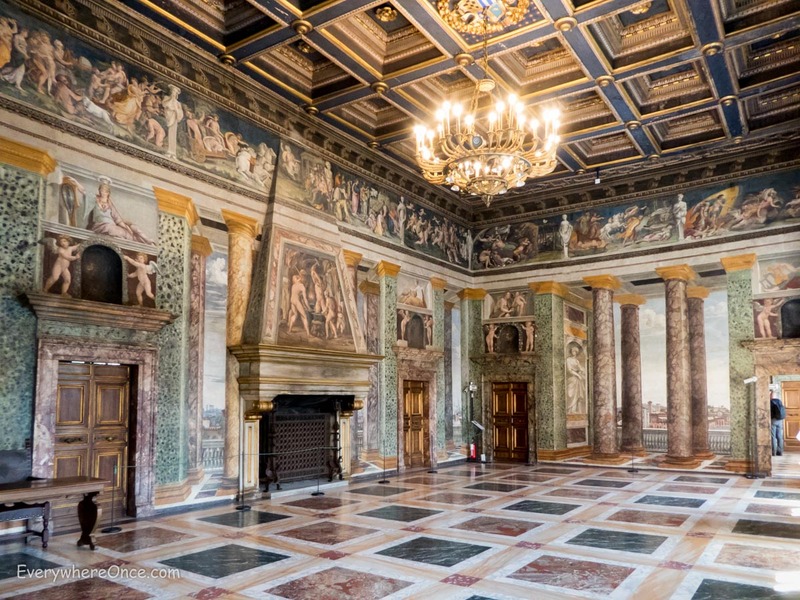 That was certainly the case with TripAdvisor’s 67th favorite attraction in Rome, Villa Farnesina. 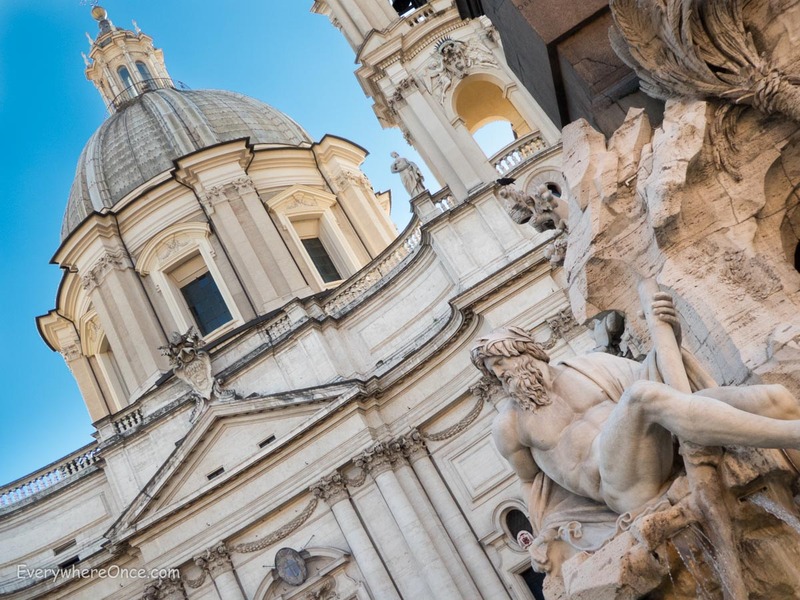 Just up the street from Santa Maria and still in the wonderfully walkable Trastevere district (TripAdvisor #36), this sixteenth century palace is a top-tier attraction by any standard. 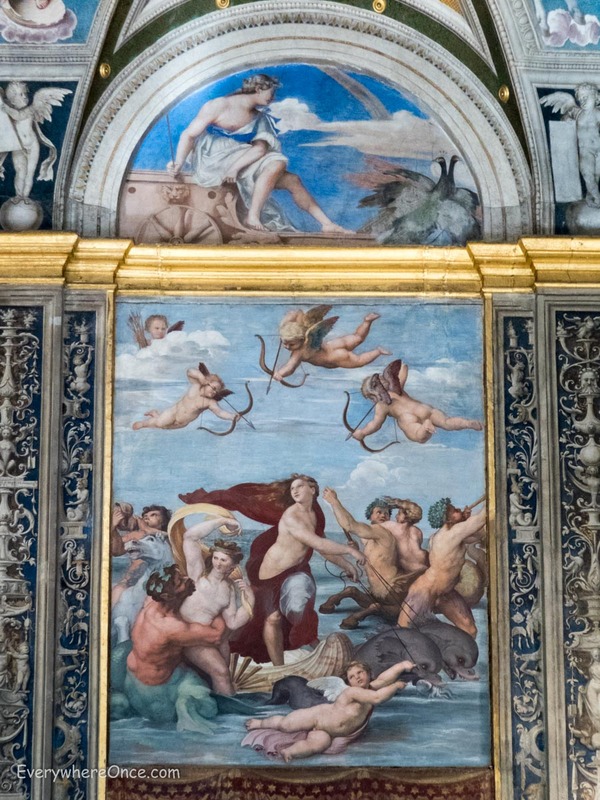 While people wait hours for the privilege of crushing in to see the “Raphael Room” frescos in the Vatican Museum, Raphael’s work also adorns the walls of Villa Farnesina. His Triumph of Galatea decorates the loggia and strongly recalls the work of another Renaissance master. The similarities between Botticelli’s Birth of Venus and Raphael’s Galatea are intriguing enough to warrant a second look. One major difference between the two is that unlike the throngs that pack into Florence’s Ufizi Gallery where Botticelli’s masterpiece hangs, the room displaying Raphael’s work in Villa Farnesina is virtually empty. 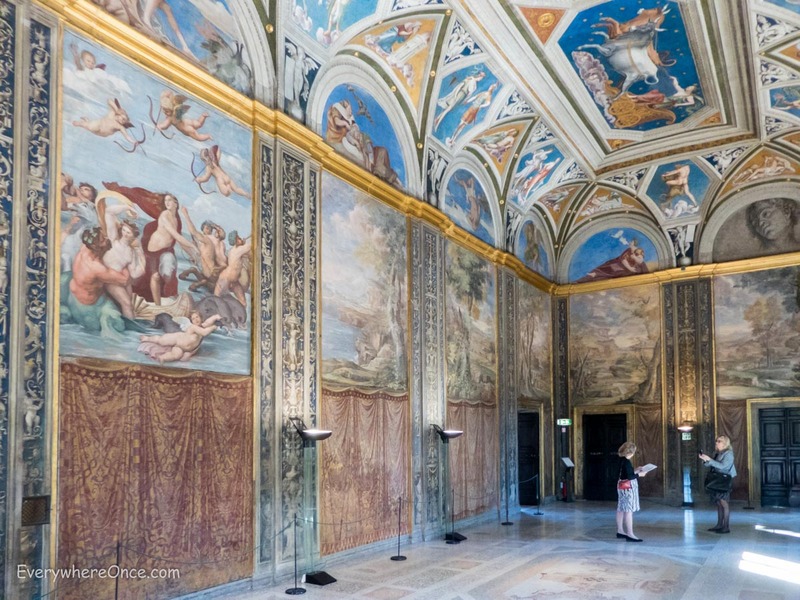 The loggia and Raphael’s Galatea are reason enough to visit Villa Farnesina, but there’s so much more to the palace than just that. Room after room holds examples of stunning Renaissance art. One of our favorites is The Hall of Perspectives, where frescoed columned porticoes “open” to faux city and landscape views. The impression given is of an expansive and airy room that overlooks a different part of the world depending on which direction the viewer faces. The illusion is captivating. We finished our tour of lesser loved attractions by stopping at Musei Capitolini (#64 on TripAdvisor.) 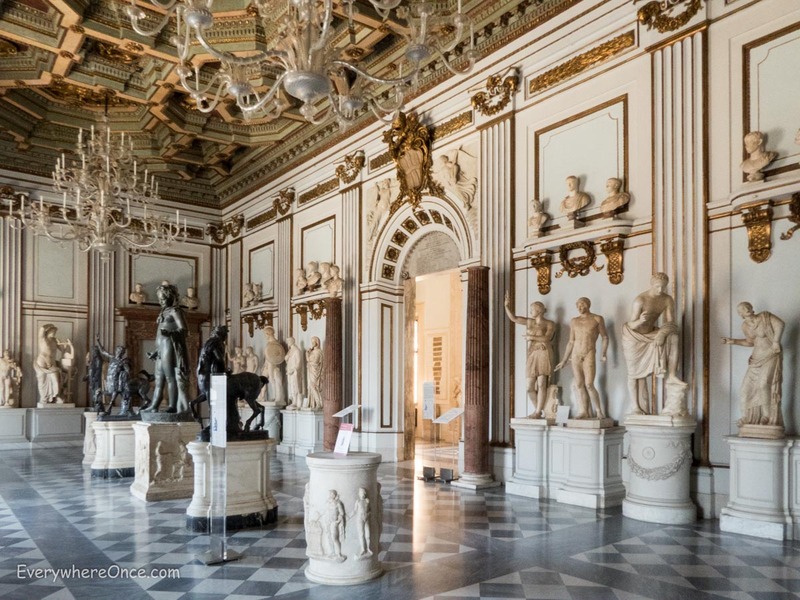 Housed in centuries old palaces and believed to be the oldest public museum in the world, Capitolini’s huge collection of Roman art spans the ages from antiquity to the Baroque. 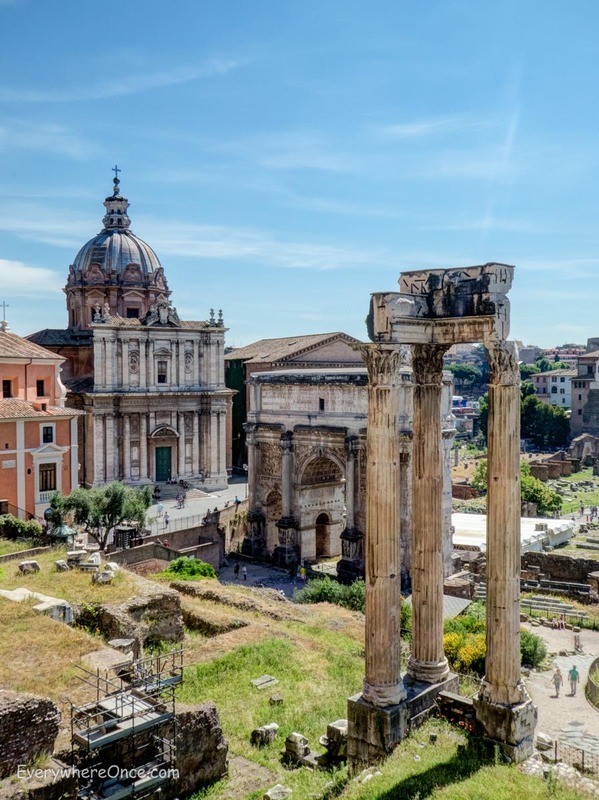 From Capitolini Hill visitors also get gorgeously unobstructed views of the Forum ruins. Get an early start: As overwhelming as the crowds are in the afternoon, they’re virtually non-existent in the morning. Rome is a completely different city before 8:00 A.M. when its streets are clear for strolling and its popular piazzas are relaxingly free of pesky vendors. And because you’re already up and out early, you can visit the most sought-after attractions at opening when lines are shortest and crowds are manageable. Focus on second tier sites: Seeing the main attractions at daybreak frees your afternoon for the city’s still fabulous, but less visited, secondary and tertiary sites. Rome is one of the few places in the world so blessed with “must see” attractions that no one can possibly see them all during a single visit. So don’t be afraid to choose some things that don’t appear on anyone’s top-ten list. Rome is such a target rich environment for tourists it is really hard to miss. Stay awhile: One of the best strategies for beating the crowds is to spend more time in a place. Because we travel slowly, we can almost always outwait the harried day trippers who are rushing from one spot to the next. And by dedicating many days to a single location we have the luxury of enjoying it in the mornings and evenings when the cruise ships and day tours are gone. You also discover that afternoon naps are a great substitute for battling other tourists. Visit in the off-season: We had such an incredible time in Rome even during one of its busiest months that we won’t wait another fourteen years to return. But when we do come back, we’re definitely planning to visit in the fall or even in the winter when hopefully we won’t have to compete so hard with other travelers for time at Rome’s top spots. ← Is this the end of (affordable) travel? Great post. Lovely photos. So ornate! I get so tired of crowds sometimes. Thank you for some ideas for alternatives. I feel that there are so many things to see in Rome that it would take quite a long stay to even scratch the surface! I do not envy those day-trippers one bit! Rome is one of my favorite cities in the world, and you’ve hit the reason why: there is so much to see and do, if you never get to the famous sites, you’ll still get an amazing experience. Great pictures; they take me right back to my times spent there. Oh, and one more excellent reason to skip the heavy tourist sites: that’s where the bulk of the thieves hang out, too. 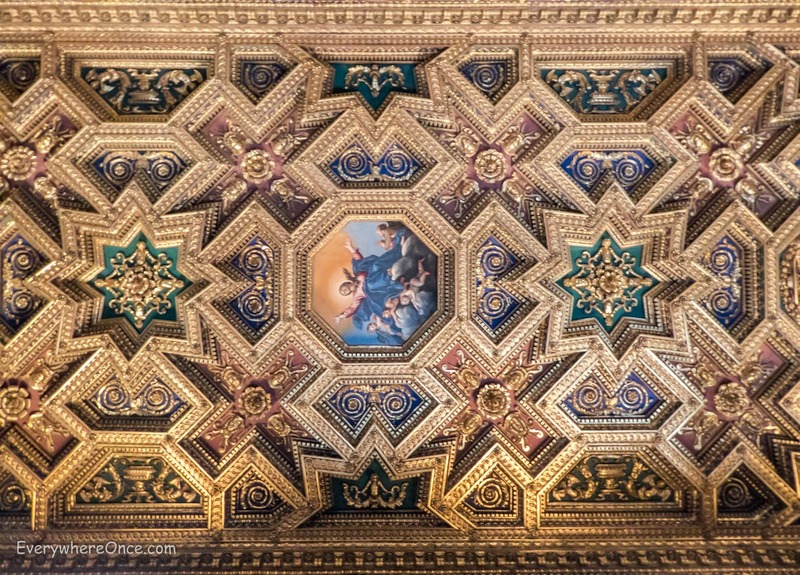 It might be easier to miss the crowds when you’re looking up at those majestic ceilings! You have awesome photos of church interiors, and I like all your suggestions of alternate places to admire. 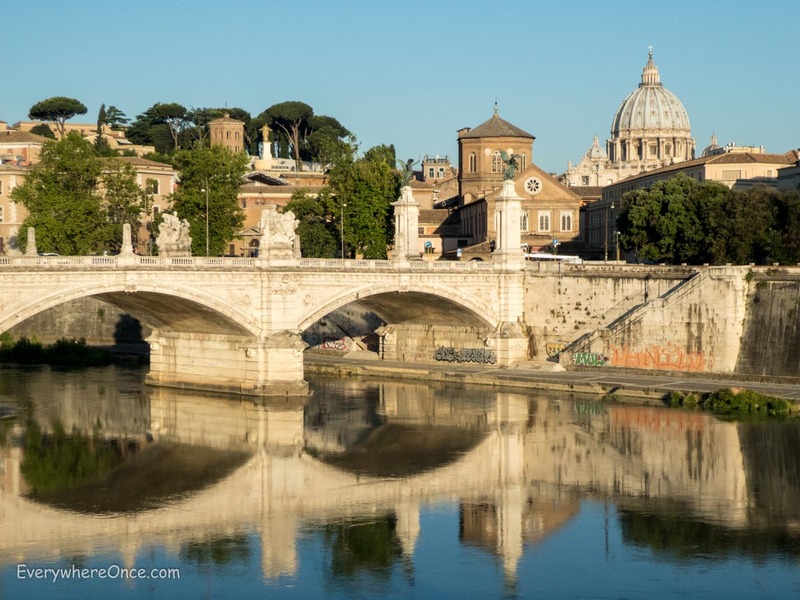 I forwarded your blog to a friend who is visiting Rome in a few weeks. We spend a lot of time in Mexico, and many of the most inspiring churches, though certainly not grandiose, are found in tiny villages. One had an intricate hand painted ceiling hundreds of years old. I would never have seen it without hiring a local guide. Very cool. We’re going to spend a couple of months in Mexico this winter, mostly traveling around the colonial cities north of Mexico City. Any suggestions you have are most welcome. 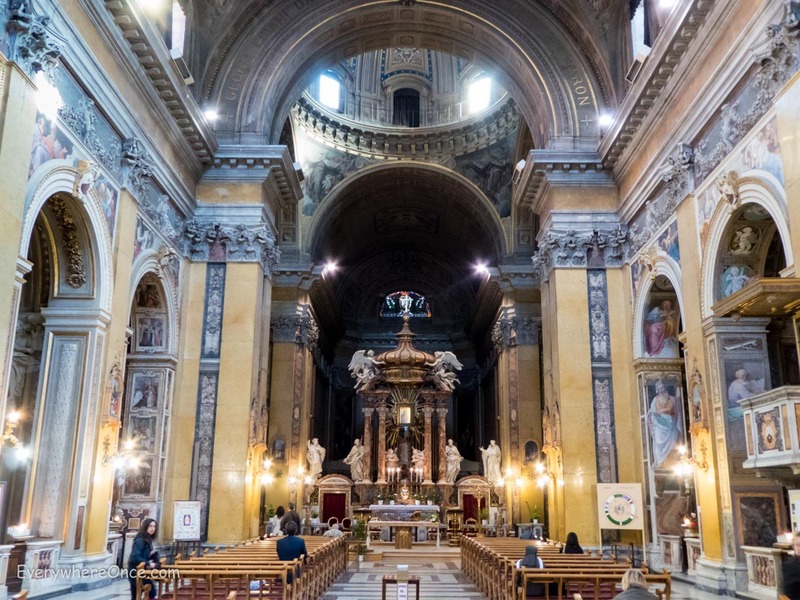 During our 10 days in Rome this Spring, we stepped into about 35 of Rome’s churchs, with much the same impression as you describe. Another suggestion I would add, is to go to churches at the time of a service. You cannot wander around during the service, but the tourists are escorted out. In addition to experiencing the purpose of the church builidng, you can quietly contemplate the hundreds of visual elements over a duration of time. How often do we pass by within a matter of seconds what an artist took years to create? P.S Many churches have morning, mid-day and evening Mass, giving one several opportunities to be without the itinerary-checkers.